Spier is a wine estate, situated east of Cape Town close to Stellenbosch. It was founded in 1692 and, as with the majority of South African wine farms of a similar age, its early labour force rested on enslavement. Spier was one of the first wine farms to develop itself as a tourist attraction during the 1960s and 1970s, reflecting a shift in the Winelands economy from just the production of wine. Presently, Spier offers visitors a number of restaurants, wine tasting, conferencing facilities, accommodation, a market, and a variety of estate tours including by Segway. Historical features have been preserved and form part of these tours. Spier is quite open about its past involvement in slavery. The 1825 slave bell has been restored and is highlighted on the audio tour of the estate. 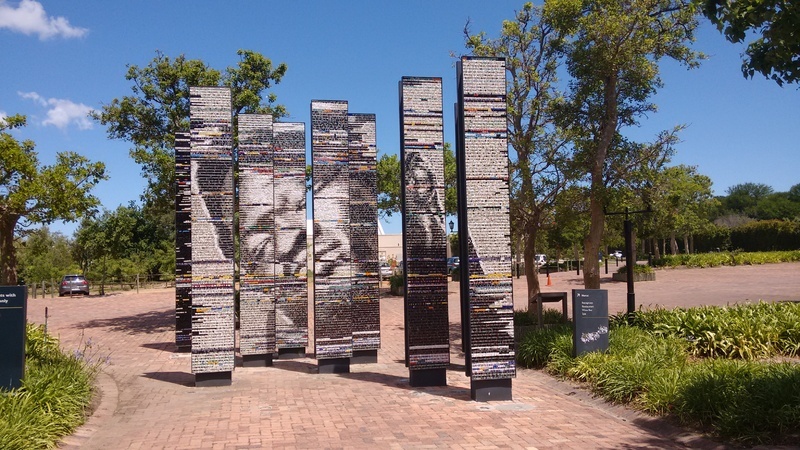 In 2012, an art piece named ‘The Dying Slave’ was designed by the South African artist Marco Cianfanelli and installed at the base of the hotel car park at Spier. This large and imposing structure consists of nine columns which, when the viewer stands at a distance, combine to produce an image which was inspired by Michelangelo’s image of a ‘Dying Slave’. More obvious local connections with slavery are evident in the ‘Gables' audio tour launched in 2012. This is narrated by a fictional enslaved woman named Sannie de Goede and set in 1836 on the eve of the ending of the apprenticeship period. Using the smartphone app VoiceMap, the narrator guides the visitor around the estate, drawing attention to historical features from the perspective of someone who was forced to work on the estate. Written by playwright Brett Bailey, it should be viewed as part of a genre of historical fiction including works such as Yvette Christianse’s Unconfessed which seek to fill gaps in the colonial archive by reimaging the voices of enslaved women.